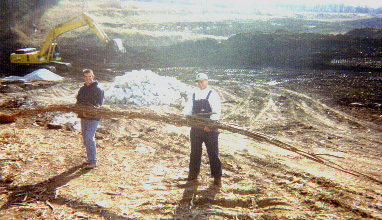 Natural Habitats employees carry a fascine during a stream restoration project in December 1998. Fascines are a tube of willow cuttings which is installed along creeks, streams, and ponds to prevent erosion. Dormant willows in the fascine leaf out in spring, rooting down to hold the soil. Fascines were one of six bioengineering tools used by our staff during the renovation of Red Fox Run, a stream on the Arbor Day Farm in Nebraska City, NE. The project was funded by the Nemaha NRD, Nebraska Environmental Trust, and the Arbor Day Foundation.